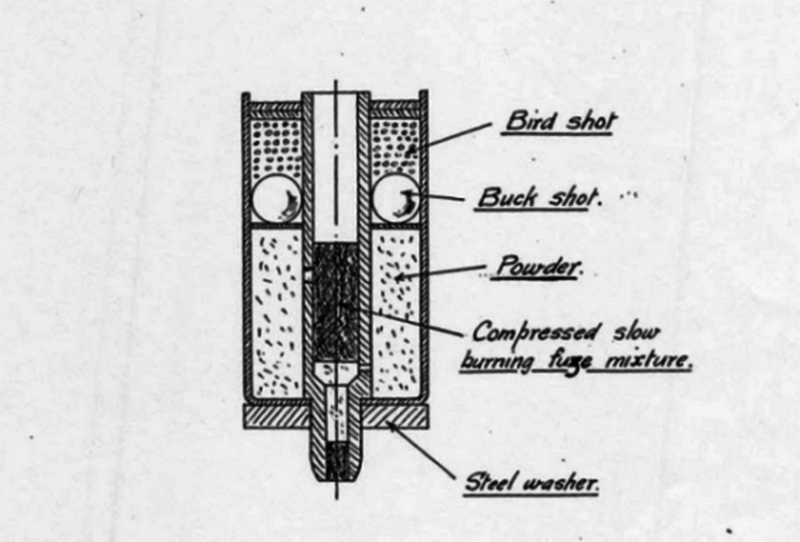 Memos from the U.K. Ministry of Munitions describe the gun as firing a cartridge containing eight buckshot and 200 birdshot at an estimated rate of one round per second. Like a hose. The weapon became known at the “Hun Stopper.” It never entered service or, apparently, even got built. History does not record exactly what the Hun Stopper looked like. It consisted of a steel tube “about ¾ inch diameter into which the cartridges fit tightly,” according to one memo. The gun featured a “trigger arrangement” near the muzzle. Maxim apparently built two prototypes, one with a 50-inch barrel with a capacity of 38 shells and one with a 28-inch barrel holding probably 18 or 20 rounds. Here’s how it must have worked. You pulled the trigger and all the shells detonated in order, emptying the barrel in just 30 seconds. This likely afforded the operator very little control over the weapon. One memo explains that Maxim believed his weapon would be effective out to just 30 yards. The British government’s primary concern with the weapon, however, was how it might violate the Hague Convention of 1907, which placed limits on small projectiles. Interestingly, Maxim noted that if the buckshot and birdshot were unacceptable, he could develop a substitute. But given the lack of control inherent in the design, it’s surprising the authorities gave the Hun Stopper serious consideration.